Spoilers ahead for The Peacekeepers! Exploring a deserted alien spaceship, Lt. Commander Data and Lt. Geordi La Forge suddenly find themselves transported light years away – into the middle of a deadly conflict! While Captain Picard and the crew of the USS Enterprise search feverishly for the missing crewmen, Data and La Forge discover they are in a station almost identical to the one they were exploring, high in orbit around an Earth-type world. Years before, the occupants of that planet accidentally stumbled onto the ship and its advanced technology – and since then have used its weapons to keep the nations on the planet below disarmed, and at peace. Now their own arrival has precipitated a crisis on the station. Somehow Data and La Forge must find a way to restore trust between the planet below and the station's guardians up above – before a final, destructive war breaks out! A planet on the brink of nuclear war suddenly discovers they are not alone in the universe when mysterious alien technology appears in orbit. One man takes control of the technology and uses it to halt the impending war by targeting the nuclear weapons on the surface and eliminating them. Can this imposed peace last? And just what is the purpose of the mysterious ship in orbit? The man in control of it hopes to find out when two visitors suddenly appear aboard the ship: Data and LaForge, who are believed to be the creators of the fantastic technology. They aren't, of course, but they must find a way to get back to the Enterprise without destabilizing this world or violating the prime directive. The Peacekeepers was the second original Star Trek: The Next Generation novel written around the time of the series premiere and published in the fall of 1988. As such, there are a few issues with the characters not quite sounding like their on-screen personas, but these issues are much less blatant than in the previous novel, Ghost Ship. In this novel, for example, Deanna Troi repeatedly calls Captain Picard "Jean-Luc," which is a familiarity we don't see her share with the captain, especially while on duty on the bridge. 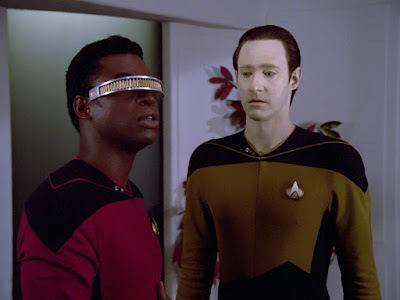 Minor quibbles such as this one aside, the characters are actually pretty spot-on, including the burgeoning friendship between Data and Geordi. One thing that The Peacekeepers handles well is the growing friendship between Geordi LaForge and Data. Good things happens when stories put these two characters together! The story itself is an interesting one. I enjoyed the exploration of an alien society that was inadvertently affected by the introduction of advanced alien technology and the effect that it has had on their culture and beliefs. As far as our TNG characters are concerned, the main focus is on Data and LaForge as they find themselves cut off from the Enterprise and must attempt to solve the mysteries of this alien society. The "guest" characters were interesting as well. The main focus is a man named Shar-Lon who believes himself to be a sort of "chosen one," destined to use the alien technology that has appeared in orbit of his world to keep the warring nations from destroying themselves. Eventually, of course, he is disabused of this notion, which has a profound effect on him. I appreciated the exploration of what it means when our expectations and reality are shattered and things don't turn out the way we expect. He had based his entire belief system on his interpretation of the alien technology, and when all of that is turned on its head he understandably has a very difficult time coping. As much as I resented his actions earlier in the novel, my heart really did go out to him as he faced this new reality. 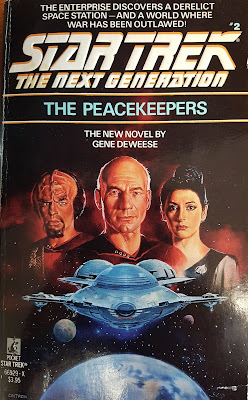 The ending of The Peacekeepers feels like it fits with the philosophy of Star Trek, with our characters finding a way to resolve the situation with a minimum of violence and allowing for the sovereignty of an alien world. The story itself isn't particularly groundbreaking or radical, but it is a solid Star Trek: The Next Generation adventure that utilizes the characters and tropes of Trek in a satisfying manner. While far from the best novel, it certainly seems to be to be an improvement on the previous story. In many ways, I felt that The Peacekeepers works well as a TNG adventure. While some of the characterizations are still not quite what we see on screen, you can tell that the book series is starting to better align with the show as we go forward. The guest characters have an interesting role to play, and while the plot isn't the most exciting, this novel still managed to keep my interest throughout. Overall, a satisfactory early adventure for the TNG crew. The first book in the Deep Space Nine: Millennium trilogy: The Fall of Terok Nor by Judith & Garfield Reeves-Stevens!